Looking for a new water heater? A tankless water heater could be the answer. 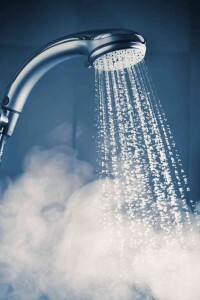 Have you been thinking about upgrading or replacing your home water heater? Consider installing a tankless water heater, which offer many benefits that a traditional water heater cannot. The hot water from a tankless water heater is consistent, so you won’t need to worry about running out of hot water during heavy usage. This means you won’t need to schedule bath times for your family to ensure everyone has hot water. Tankless water heaters are also very versatile as they take up significantly less space than traditional tanks. You can mount them indoors or outdoors as the space in your home allows, and reutilize the saved space in your home. Tankless water heaters are environmentally friendly. They are 30% more efficient than a standard 50 gallon tank, so you can rest easy knowing that your tankless water heater is helping to save the environment. Not only that, your new tankless water heater is easy on your wallet, saving you up to 40% every month on your utility bill during the heater’s lifetime. It’s an investment that pays for itself. Your new tankless water heater will last a long time – on average, it will last 20 years. That’s twice as long as the average traditional water heater! They are also much more reliable, and come with longer warranties as a result. You’ll be saving money on your utilities as well as on the upkeep of your water heater. With the tank element in the water heater gone, your hot water will not be subject to the rust and scaling that would be present in a traditional water heater, making your water safer and cleaner. Tankless water heaters also have excellent safety features which will ensure that scalding hot water will not burn you or your family. This makes a tankless water heater setup especially ideal for families with young children and/or senior citizens, who may be more prone to problems from scalding hot water. Ready to Upgrade or Replace your Old Water Heater? Give Master Plumbing a call at (301) 650-9100 or contact us online to get more information on how our expert plumbers can help you plan and install a new tankless water heater in your home. We have received Angie’s List Super Service Award recognition for plumbing and drain cleaning every year since 2007, in addition to the Best Plumber award from Best of Bethesda. We are fully licensed, bonded, and insured and our service is unparalleled. Give us a call today—you won’t regret it! To see examples of our projects, follow us on Facebook, Twitter, and Pinterest. This entry was posted on Friday, September 2nd, 2016 at 4:14 pm. Both comments and pings are currently closed.